i wonder whats going to happen with the whole jersey number thing, but i dont think kopecky should have to give it up. he did earn it in my opinion. The Wings’ site has been updated with new jersey numbers. Tomas Kopecky switches to #82 with Brian Rafalski taking #28. Dallas Drake takes the #17 vacated by Kyle Calder‘s depature, with the #28 he wore during his first stint in Detroit now taken and the #11 (Cleary) and #10 (retired for Delvecchio) he has also worn unavailable. The players most likely destined for Grand Rapids haven’t been updated. 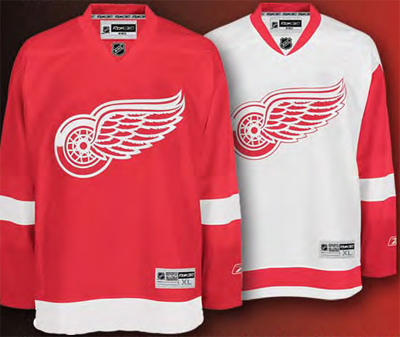 The Freep has a bit more on the Wings’ new jerseys today. Turns out there will be one big change, the captain’s “C” is switching sides. The letters had to be moved because the new jerseys are made of multiple panels, and there wasn’t room for them above the tip of the Winged Wheel on the left side without hitting a seam. 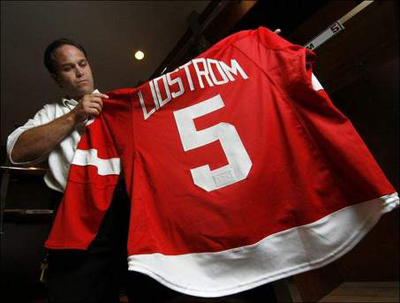 And if you look at some old Wings photos, that’s actually been done before, too. The Wings are the only team making that change. It’s similar to the one the Rangers had to make, changing the angle of their slanted lettering in order to fit the letters all on the same panel. 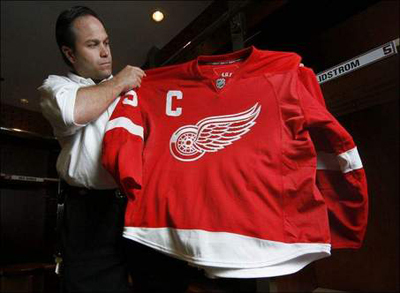 This probably means that if the Wings ever need to wear a patch, such as the Cup Finals patch that usually goes opposite the captain/alternate captain letter, it will be shifted onto the shoulder. We’ll have to wait and see about that, though. And we can all breathe a sigh of relief. There are a few small changes here and there. The white stripe at the bottom of the red jersey seems thicker to me and the red stripe on the white jersey looks a little lower. I can’t tell if the shoulder “notches” are still on the white jersey, I’ll miss them if they’re gone but it won’t look bad either way. The big change is the collar, with the NHL going the NFL route and adding the league logo there. I think the laced collar sported by Boston (and others) looks better than the standard collar that the Wings went with but since Detroit didn’t have a laced collar to begin with, I can see why they didn’t go with one this time. So we end up with the same basic design, which is 100% fine by me. No needless piping or overdone striping or combinations of the two. Yep, good enough for me.